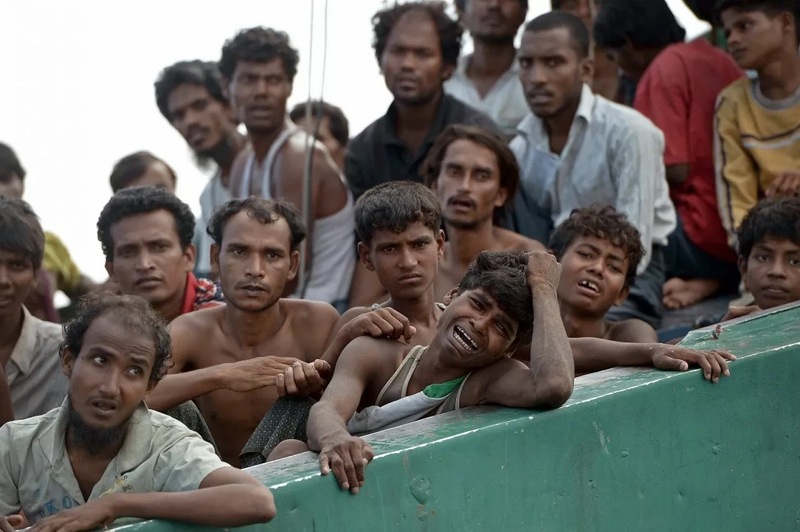 Rohingya migrant boat crisis: Who is to blame for thousands of people stranded at sea? More than 430 migrants were rescued by Indonesian fishermen today after weeks stranded at sea as ministers met to address the boat crisis in Southeast Asia. After years of refusing shelter to desperate people trying to reach their shores, Indonesia and Malaysia have offered to provide temporary refuge to thousands of men, women and children currently stuck on boats. Thailand, Malaysia and Indonesia estimated 7,000 people were stranded at today’s meeting but the UN refugee agency believes there are 4,000 at sea and activists had initially put the number at 6,000. Food shortages has driven migrants to fighting over aid supplies, survivors have said, and around 100 people are reported to have died on one boat after being stabbed, hanged and thrown overboard during a scramble for the final scraps of food. Anifah Aman, the Malaysian Foreign Minister, said his country would provide humanitarian aid and “temporary shelter provided that the resettlement and repatriation process will be done in one year by the international community”. Thailand did not extend the offer of shelter but is giving aid after previously claiming it cannot afford to take any more migrants after the arrival of tens of thousands of refugees from Burma. Most of those leaving the country are ethnic Rohingya people fleeing systematic religious and ethnic discrimination, as well as violence from Buddhist extremists. As well as fleeing Burma by land to Thailand, they are one of the largest groups among boat migrants, alongside poverty-stricken Bangladeshis. Rohingya are a Muslim ethnic minority who claim to be indigenous to Burma but the predominantly Buddhist nation denies them citizenship, as does Bangladesh. They have faced decades of state-sanctioned discrimination and the UN has named them as one of the most persecuted groups in the world. Burma’s co-operation is seen as vital to solving the crisis but its government has already cast doubt on whether it will attend a conference to be hosted by Thailand on 29 May alongside 15 nations affected by the emergency. In the past three years, Rohingya people have been targeted by violent mobs of Buddhist extremists, leaving hundreds dead and sparking an exodus of more than 120,000 people, according to the UNHCR. Even the name Rohingya is taboo in the country, where they are widely called “Bengalis” and alleged to be illegal immigrants from Bangladesh, even though Rohingya have lived in the country for generations. Genocide Watch, a group monitoring atrocities around the world, has declared an emergency in the state of Rakhine where around one million members of the minority are believed to live. The UN has urged the Burmese government to give Rohingya equal access to citizenship and to crack down on Buddhist violence against them and other Muslims. The International Organisation for Migration has said countries including Indonesia, Thailand and Burma are plying “a game of maritime ping-pong” with people's lives while refusing to allow migrant boats to land. Authorities have delivered aid and food to the migrants while at sea but claim bringing them to shore would constitute illegal entry into the countries that they will not allow. Last week, the Indonesian navy turned away a boat crowded with thousands of trafficked refugees, sending it on to Malaysia and the next day, the Malaysian authorities rejected two boats carrying at least 800 people between them after blockading its north-western sea border. Thailand has hurriedly repaired boats' engines and shooed them out of its waters. The mass trafficking has been going on for many years but no co-ordinated strategy has been drawn up to deal with the influx of boat people. Most of the migrants are believed to be victims of human traffickers, who recruit them in Burma’s Sittwe province and in Bangladesh with promises to give them safe passage to Malaysia and jobs once they land there. Traffickers have been abandoning boats before reaching shore, fearing arrest by governments cracking down on their trade in a similar pattern as seen on migrant boats from North Africa to Italy and Greece. Thai authorities have discovered a mass grave at an abandoned trafficking camp in the far south of the country, close to the Malaysian border, containing the corpses of more than 30 Rohingya who had died from disease or starvation while traffickers awaited further payment before smuggling them into Malaysia. The 430 migrants rescued by a flotilla of Indonesian fishermen today included Rohingya, and 3,000 more have already landed in the three countries in recent weeks. “They were suffering from dehydration, they are weak and starving,” Khairul Nove, head of Langsa Search and Rescue Agency, saying there were many women and children among the passengers. “We ran out of food, we wanted to enter Malaysia but we were not allowed,” he added. Malaysian Foreign Minister, Anifah Aman, said the crisis was a global issue and said Asean countries needed help to settle refugees. Like the boat crisis in the Mediterranean, the myriad crises and conflicts driving people to flee their countries have been ongoing for some time. The UN General Assembly passed a resolution urging Burma to provide full citizenship to Rohingyas and allow them free movement last year but it was swiftly rejected by the government. Asean also has a strict policy of non-interference in member countries' internal affairs, meaning neighbouring states affected by the Rohingya exodus are powerless to influence Burma's policies. Migrants have been making the journey across the Andaman Sea for years but their plight has only recently made international headlines and earned public condemnation from UN agencies and foreign governments. The UNHCR has offered Malaysia medical and other aid to process migrants arriving on boats but the other countries facing an influx claim they need help and money to handle them.